After decades of war between Aborigines and European 'settlers', Lt-Governor Arthur appointed in 1829 a 'conciliator', GA Robinson, to remove all remaining Aboriginal inhabitants from Van Diemen's Land to an outlying post, Wybalenna, on Flinders Island. By this period, west coast Aboriginal people were retaliating for wrongs committed against them by Europeans. At least one west coast Aboriginal woman and two men, Naydip, Panenemeroick and Dewooradedy, were each missing an eye from being shot by muskets. Reheleep, a fourteen-year-old girl, had by 1832 been held at the Pilot's Station of Macquarie Harbour for many months, and a young boy, Penderoin, had been chased several times by white men in the same area and let go when they realised he was not female. Robinson arrived at the south-west coast in 1832 determined to remove the inhabitants essentially by convincing them that it was for their own protection. 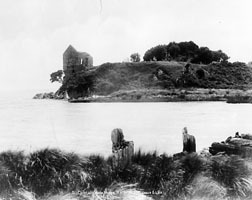 The small island in Macquarie Harbour, known to Aboriginal people as Langerrareroune, was called Sarah Island by the British colonisers and was operating as a penal settlement. It also became a staging-post for west coast Aboriginal people or Toogee to be forcibly detained en route to Flinders Island. In five raids between 1832 and 1833, Robinson brought 55 Aboriginal people to Sarah Island, including fourteen children, of whom it is thought eight died within twelve months of being removed from their families. Once on Sarah Island, sixteen Aboriginal people rapidly died, eleven soon after the death of a close relative. More deaths followed in the far north-west soon after people left Sarah Island on the way to Wybalenna. On Flinders Island, all but three of the remaining west coast people died. Official records state that a form of pneumonia afflicted them, but the shock of capture, separation from home and family and gross mistreatment by the convicts and the militia on Sarah Island all contributed to the death count. Sarah Island is a place of memorial and remembrance for Palawa people. The incarceration, gross mistreatment, death and interment on this island of many west coast Aboriginal people over a two-year span has cast a sense of disquiet and sorrow over the island. The parallel convict history of the site and subsequent tourism ventures do not adequately respect the memory and resting place of those with another history – that of the captured Toogee. Further reading: N Plomley (ed), Friendly mission, Hobart, 1966; and Weep in silence, Hobart, 1987; L Ryan, The Aboriginal Tasmanians, Sydney, 1996.